Pope Francis has officially named Vancouver Developer Elie Kassab a Knight of the Pontifical Equestrian Order of St. Gregory The Great. The Maronite Eparchy of Our Lady of Lebanon on behalf of the Chair of Saint Peter is honored to announce that the Holy Father, Pope Francis, has named Elie George Kassab, businessman and philanthropist, and parishioner of St. Sharbel Catholic Church in Portland, Oregon; a Knight of the Pontifical Equestrian Order of St. Gregory The Great. 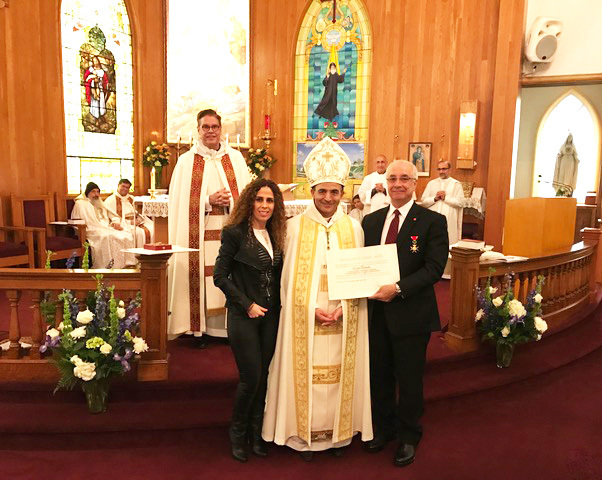 The Letter and Insignia were presented to Elie Kassab at a Pontifical Mass held at St. Sharbel Catholic Church on October 30, 2016 offered by the Most Rev. A. Elias Zaidan, Bishop of Eparchy of Our Lady of Lebanon, of Los Angeles. Concelebrating the Mass were the Rev. Christopher Fabre Pastor of St Sharbel Parish, the Very Rev. Jonathan Decker, Prior of the Maronite Monks of Jesus, Mary and Joseph, and Rev. Theodore Lange of the Archdiocese of Portland, with assistance at the altar from Deacons Tony Karam and Wadih Kaldawi. In his letter, His Eminence Pietro Cardinal Parolin, the Secretary of State for the Holy See expresses his gratitude to Elie Kassab for the significant contributions made to St. Sharbel parish in Portland, and to the Maronite Monks of Jesus, Mary and Joseph in Castle Rock, Washington, and for invaluable assistance to the Holy See. The recipient’s family and friends were present to share the occasion. Elie Kassab said about this honor, “I never knew about the Order itself and, more than that, I never expected any rewards for my charitable deeds – I am humbled by the honor bestowed upon me by the Holy See and Pope Francis”. The Knights of the Pontifical Equestrian Order of St. Gregory the Great was established in 1831 by Pope Gregory XVI and is one of the highest honors awarded to a layperson by the Church. It is one of the five orders of knighthood of the Holy See. This order is bestowed on the Catholic faithful in recognition of their personal service to the Holy See and the Church, unusual labors, and the good example they set in their communities and countries. Past recipients include Dr. Clinton Allen Brand, Professor of English in Houston, Texas; James Serritella, attorney in Chicago, Illinois; Eunice Kennedy Shriver, founder of the Special Olympics; Ricardo Montalban, Mexican-born American-based actor and philanthropist; Walter Annenberg, creator of TV Guide; Angelo Branca, Canadian Judge; Hector P. Garcia, Mexican-American Civil Rights Leader; Ann Widdecombe, British politician; and Carl A. Anderson, Supreme Knight of the Knights of Columbus. View the letter from the Parish here. Downtown Vancouver soon will feature more apartments, condominiums and retail shops along its bustling I-5 Mill Plain entrance while honoring two outstanding longtime community leaders through a mixed use project that has been approved for development. Elie Kassab, president of Prestige Development, said construction costs for the project are estimated at $11.5 million. He expects to select a general contractor in the next two months, break ground in spring 2016 and complete construction by spring 2017. Wilson Associates of Vancouver is handling all of the architectural planning. “This is the type of stand-up businesses that blesses and unites communities,”-Event Organizer, Steve Walker about Battle Ground Cinema. Congratulations General Manager Cruz Orozco and his staff! Independence Cinema won two awards at the 49th Annual Community Awards Banquet hosted by the Monmouth-Independence Chamber of Commerce. Independence Cinema won awards for Retail Service of the Year and Business of the Year.